Prospective families are invited to tour our campus, meet our faculty, teachers, students, and see all of the wonderful learning opportunities that we offer. If you would like to schedule a tour, call our admissions office at (310) 674-8470 ext. 216 or email admissions@smabelles.org. 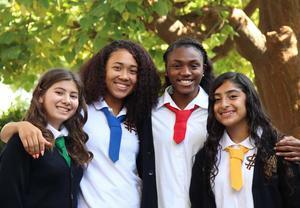 Come experience St. Mary's Academy (SMA) during Open House on Saturday, November 17th from 12-3 PM. Visit SMA to see classroom mini lessons, our club fair and all of the wonderful learning opportunities SMA offers. Meet our faculty, students, parents and coaches. Student Ambassadors will provide school tours. Admission, merit scholarship, financial aid information, mini presentations and refreshments will be provided. Open House starts promptly at 12 noon! Drop in and stay as long as you like! Please RSVP here. Seventh and eighth grade students are invited to become a Belle and "shadow" a current St. Mary's Academy student. Shadow days are a great way to experience St. Mary's Academy and can help you with your high school selection process. Students will be paired with one of our current student ambassadors and will have the opportunity to talk to the admissions team, meet our principal, faculty and staff, visit our classes, tour our campus, and receive admission information and will be able to enjoy a complimentary lunch with our students. Shadow Day begins at 8:30 a.m. and ends at 12:30 p.m. unless otherwise specified. Students are to wear their school uniform. If they do not wear a school uniform, please wear pants (not jeans or distressed clothing) a blouse, t-shirt and closed toe shoes. Space is limited, so please register no later than a week before the scheduled shadow day. Please allow 24-48 hours for the admissions team to confirm your visit. A telephone call or an email will be sent to confirm your shadow day and time. Arrive promptly at 8:30 a.m. in the school office to sign in and out your student. Email your reservation to admissions@smabelles.org. Spaces fill up quickly!